Need Parking sensors installed on the front of your vehicle? Most vehicles come standard with rear sensors, but not many come with front sensors fitted from the factory, This is a perfect upgrade to make sure you don’t hit the front end of your car when parking. We can fit Cobra 21mm standard sensors or 17mm flush sensors to your vehicle. All the sensors we supply and install can be professionally colour coded. Cobra standard sensors sit around 1mm away from the vehicles body once fitted giving a nice sleek appearance. The Cobra 17 mm brand can sit completely flush to give the complete factory apperarance. All our sensors are professionally sprayed by a body shop to give the best possible paint job that will last for many years. Some companies spray them with a spray can this should be avoided due to the paint not having any time to cure before installation or there being no laqure applied meaning the paint won’t last long before cracking or flaking from the sensor heads. The Front sensors are activated instantly once the vehicles ignition is turned on. After 40 seconds they will time out meaning you drive the vehicle as per normal. If you wish to park simply tap the P switch and the sensors will become active again for 40 seconds. If the sensors detect objects within them 40 seconds the sensors will remain on / active. When the vehicles ignition is switched off the sensors will shut down completely. 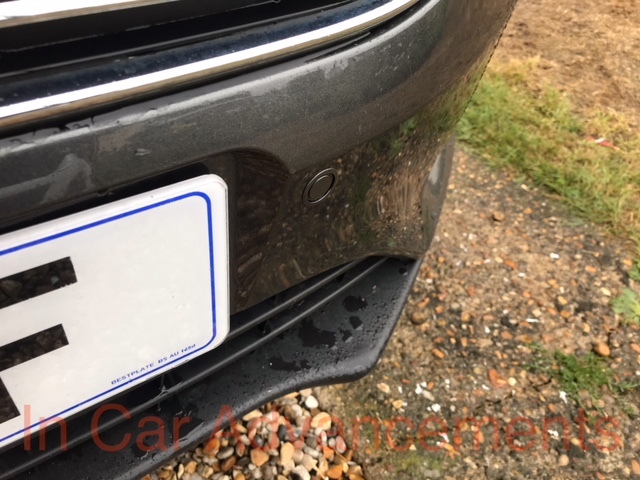 Remember we install front parking sensors at your home or workplace in the Essex area. We only install Cobra front sensors due to there advanced programming and reliability. 3 year warranty as standard.